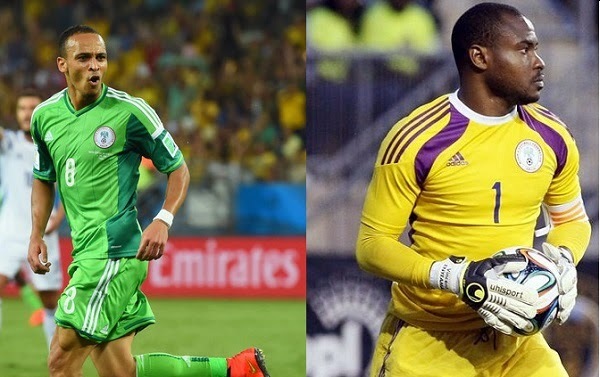 Nigeria goalkeeper Vincent Enyeama and Osaze Odemwingie have quit the Super Eagles team following their defeat to France in the Worldcup knockout stage. This comes just a day after team coach Stephen Keshi and captain Joseph Yobo also threw in the towel. He also went to His Instagram page to say: I want to say a very big #THANK GOD to my #SUPER GOD# and to all my fans and and the supporters of the national team.for all the good will messages,all the love and support that you gave to me and my colleagues.we couldn’t make it past that stage.#WEARENIGERIA.#ILoVeYoU#youall were amazing and great.#Thank you so much '. Final Ideal BRAZIL VS GERMANY..LOL.